Thank you for posting/blogging about this, Tenkar! And for being a backer! Also, since the current content creators aren't allowing commercial use of their content, it's a prime opportunity for an enterprising artist to step up and offer a "commercial-use-OK" Add-On. They'd probably make a killing. This is a shame. I'd pay $$$ for a commercial content pack like what Campaign Cartographer does with all their sets. "(all these Add-Ons will also be available for commercial use, for a higher price)"
With the recent addition of Bogie's and Kepli's Add-Ons, there are now 6 paid for Add-Ons that allow for publishing or commercial use, and there is a new Pledge Level that offers them all in a slightly-discounted bundle. And an additional 3 free Add-Ons that allows this, for a total of 9 Add-Ons. Update: All Stretch Goals have been unlocked! 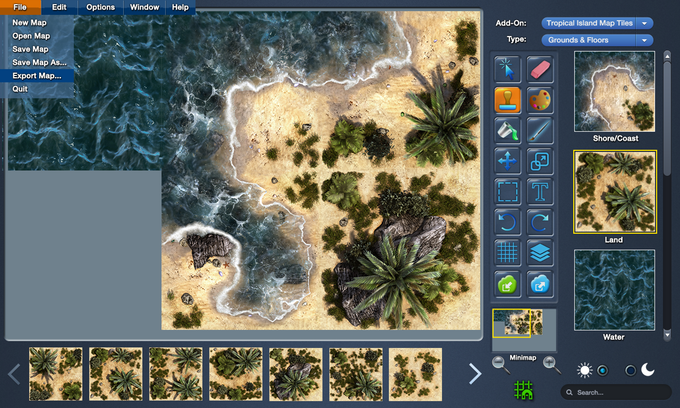 With a total of 9 free Add-Ons, support for randomly-generated maps, and a free utility app that allows users to create their own free Add-Ons, this campaign should now be more tempting than ever. Currently at 1350 backers and nearly 500% funding.